Unfortunately, I have yet to plop down a grand and a half for the Sony A700. However, those who are on the fence about purchasing the A700 will enjoy these three links which further praise Sony's Advanced Amateur dSLR. "Luminous Landscape: Sony A700 Field Report" - written by Douglas Brown, this article spends very little time "pixel-peeping," and instead, more on the camera's real-life usability. "My experience with the Sony Alpha 700" - this piece focuses on upgrading from the Konica Minolta 7D. 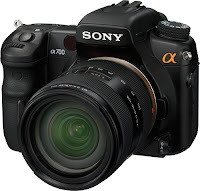 "Sony Alpha DSLR-A700 Review" - Phil Askey & Simon Joinson's review analyzes the camera's technical abilities: from start-up time (in seconds) to noise grain (as compared to the Nikon D300, Canon 40D, and other similar cameras in this class).